Modular Plastic Belt Conveyor is a customized solution for carrying larger products. The components used to build such conveyors are standardised, enabling simplified engineering, lesser maintenance and better operational efficiencies. Modular Plastic Belt Conveyors provides high quality specialized solutions for virtually every type of application. These modular plastic belt conveyor offer many advantages over metal, fabric or running belt conveyors. These conveyors utilize hinged, interlocking plastic segments to form the belt instead of a conventional flat belt. This allows for a segment of damaged belt to be replaced, reducing amount of downtime and belt replacement costs. The modular plastic belt conveyor are a good choice for accumulation conveyors. Depending on the application and type of product to be conveyed, appropriate belt can be chosen for the application. 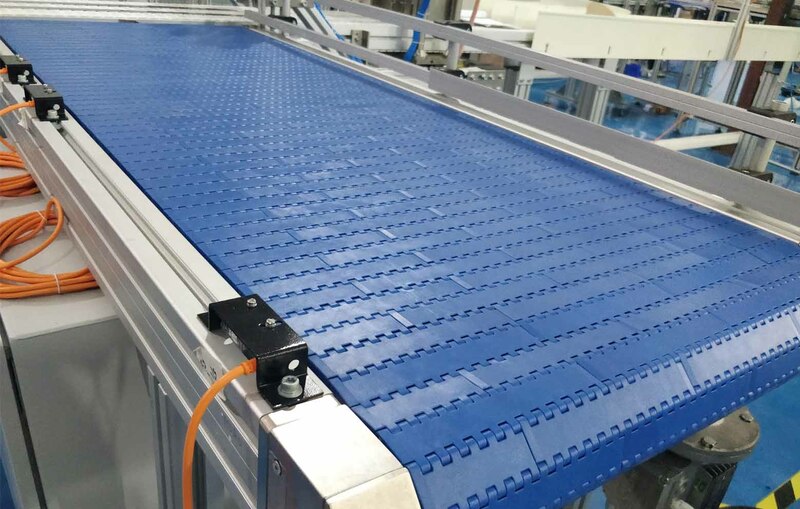 Some of the advantages of using a modular plastic belt conveyor include longer belt life and less wear, simplified cleaning and maintenance, enhanced worker safety and zero need for lubrication or tensioning.